We have released our long- anticipated guide to historical documents and autographs, In the Presence of History. 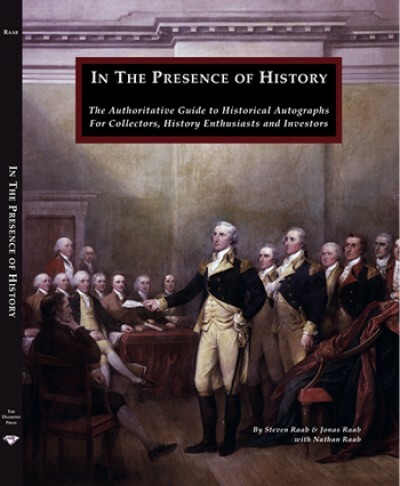 This 178-page book instructs the reader how to determine quality and value, what to seek out and buy, and methods to authenticate autographs. It also contains the most comprehensive full color study of the documents of the U.S. Presidents ever published, with hundreds of illustrations. We have poured into this work a passion that extends back more than three decades and the experience that comes with having handled some of our nation’s more important documents. Hundreds of full color illustrations, dynamically presented, and all from our archives. A special "Manuscript Edition" of this publication comes with an early 14th century vellum manuscript, a multi-color leaf from a French religious text circa 1325. These were some of the first documents ever to be collected. This Edition comes with an original tipped in.